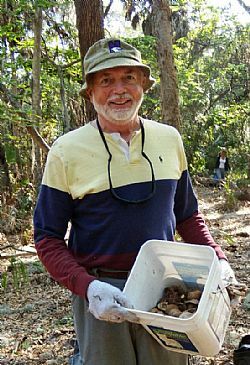 The Tampa Bay Estuary Program is sad to report the recent death of friend and longtime Give A Day volunteer Bob Dougherty of Tampa. Bob, an attorney, was one of our most dedicated volunteers. "He always had a smile and worked harder than some of the younger people. He will be greatly missed," said TBEP Outreach Specialist Colleen Gray. A memorial service will be held for Bob on Saturday, April 6, from 5 p.m.-8 p.m. at the Best Western Bay Harbor Hotel, 7700 W. Courtney Campbell Causeway, Tampa. In lieu of flowers, Bob's family is asking that contributions be made in Bob's memory to the Estuary program. Donations may be made online via the TBEP website. A special "Give A Day For The Bay" invasive plant removal workday will be held in Bob's honor on Saturday, April 6 from 8 am-1 pm at Lowry Park Zoo. The Zoo will be partnering with TBEP for this event. Volunteers will be needed to remove invasive plants from within the zoo. 50 volunteers are needed for this workday. All volunteers will receive lunch and a thank-you gift for helping out! This workday is being funded by the generous donations of Bob's family and friends.